I don't go anywhere without a water bottle. I can't even begin to guess how many plastic water bottles we have in our kitchen cupboards. Some work great, while others don't. I hate when I grab a water bottle, head out the door, and then find it leaking and making a mess all over everything. My children are also active in sports, so having durable, reusable water bottles is essential for making our lives a little bit easier. The Glasstic Shatterproof Glass Water Bottle is perfect for all of your favorite beverages (hot or cold) for a variety of key reasons. 1. It's Shatterproof! Designed with a glass insert on the inside of a durable plastic outer casing that helps protect from breakage while providing containment and shatter proofing even if the glass does break. Glasstic customers can rest easy knowing that they offer a free glass insert replacement in the first year and also sell them for the life of the product for just the cost of shipping. How cool is that? 2. It's Safe & Pure! 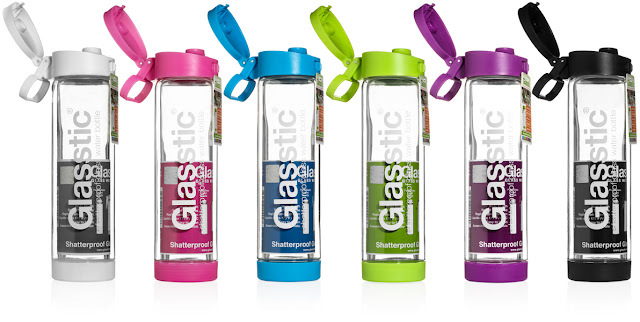 Glasstic contains a 16oz pure glass insert on the inside where your liquids are and a BPA Free Plastic outer shell around the glass to provide durability and containment. No risk of bad chemicals leaching into your water or beverage. 3. It's Easy to Clean! Glasstic can be easily disassembled and cleaned manually or in the top rack of a dishwasher. There is Another $5 Off $5 Kohls Coupon – Check Your E-mail! I just found a great coupon from Kohl's in my inbox! The coupon is a $5 off $5 Kohl’s coupon! Unlike the last $5 off $5 Kohl's coupon I received earlier this week, that was only valid for one day, this $5 Kohl’s coupon doesn't expire until July 5th. I LOVE shopping at Kohl's and I can't pass up an opportunity to do a little free shopping! That's right, a $5 off $5 Kohl's coupon is just too good to let go to waste. Plus, you can also stack it with other Kohl's coupons for even more frugal shopping. 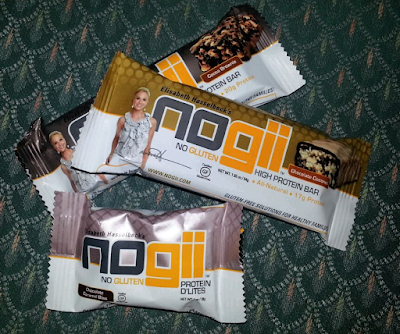 NoGii ~ Protein Packed, Gluten Free Energy for Families On The Go! My family is always on-the-go. Whether we are headed to our son's wrestling practice or a tournament, our daughter's Girl Scout event, to work or school, or to the lake for a little family relaxation. I'm sure that any family can relate to the lack of time we seem to encounter on a daily basis! Are you looking for a quick, healthy, and satisfying snack for those days when you and your family are on-the-go? Then look no further... NoGii’s protein bars have the ideal balance of protein, fat, and carbohydrates, making them a perfect, satisfying snack for the whole family to enjoy while on-the-go or after a workout. NoGii offers you a healthy, clean, and nutritional gluten-free choice for you active lifestyle. Whether you're on the go, at work, playing with the kids, or hitting the gym, these all-natural bars created by Elisabeth Hasselbeck supply quality carbs, ultimate taste, and high protein. Created by Elisabeth Hasselbeck, co-host of The View, ABC News Contributor, and author of the New York Times bestselling book The G-Free Diet: a Gluten-Free Survival Guide, NoGii protein bars and protein powders are a gluten-free solution for active families. My son will start high school this fall and it already active with the high school wrestling team. 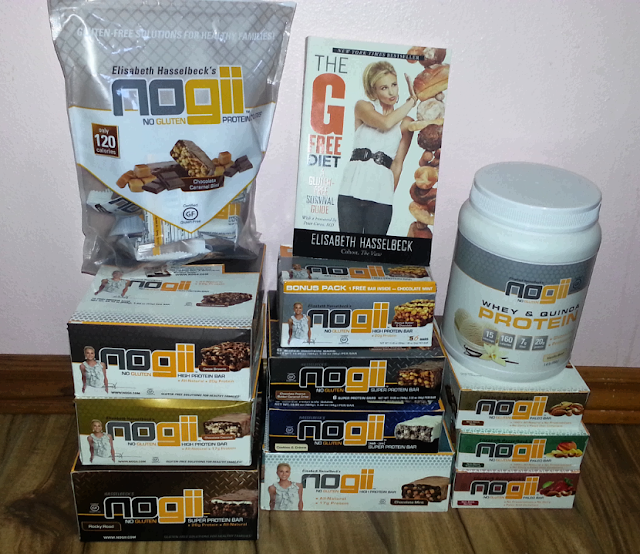 When my he saw what was inside my Nogii shipment, the look on his face was priceless and so was his comment. He simply said, "Thanks Mom, these are ALL MINE!" Guess what?? 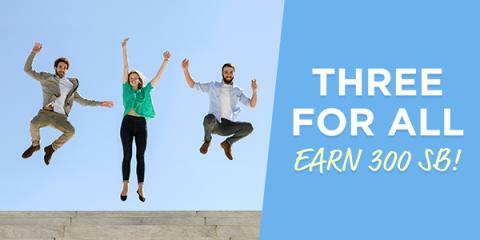 Swagbucks is doubling the amount of SB you earn from Encrave! For two days only (Monday, June 29th & Tuesday, June 30th), you get 2X the SB when you earn from Encrave. For all the Encrave SB you get on Monday, you'll receive that same amount again on Tuesday as a bonus. Same goes for Tuesday: the SB you earn on Tuesday from Encrave will be credited as a bonus on Wednesday. That's getting a double payout for the same thing! Encrave is a great way to get closer and closer to your next gift card, by browsing videos, articles, slideshows and sites online. It's easy! My favorite free reward on Swagbucks is the Amazon gift cards. I redeem for them throughout the year, save them up, and then use then to purchase Christmas gifts for my kids! It's the perfect way to get them the gifts they want while being frugal and not breaking the bank! I can't even begin to guess how many snack bags and sandwich bags we go through in a year. I use them daily in both my kid's lunches and my husband's lunch. Snacks, sandwiches, storage, party favors... they have so many uses! 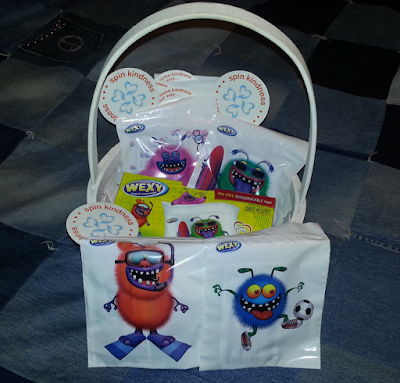 Inspired by kids and created by moms, made in the USA, WEXY bags are great for lunch snacks, school snacks, or kids treats Using WEXY bags can help motivate your kids to eat healthy kids snacks such as raw food, organic snacks, gluten free or any other healthy recipe for kids. This post is brought to you by Smiley360. I received product samples to facilitate my review and a promotional item to thank me for my participation. As always, all opinions are 100% mine. Laundry is one household chore that never ends... especially when you have two active children in the house. I want to make sure that my children always look their best, no matter what they are doing, and having dingy looking clothes in not an option! Knowing that I'm doing all I can to make sure their clothes are clean, bright, and smell good is very important to me. 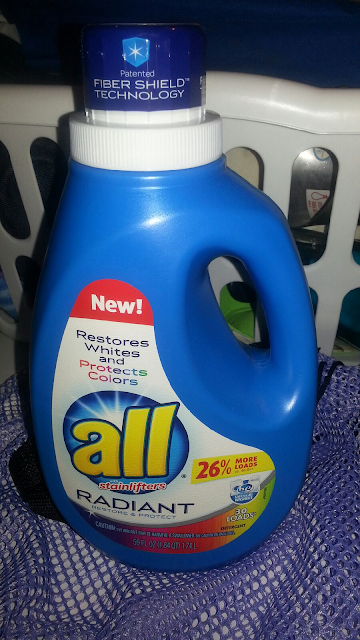 What if I told you that there is a new laundry detergent that restores whites and protects colors? Would you want to try it? "Some clothes are more than just fabric. NEW all Radiant helps restore whites and protect colors, meaning your kids’ favorites can go on even after they’ve been outgrown. Long live your clothes! Introducing NEW all® Radiant! Infused with Patented Fiber Shield™ Technology, to restore dingy whites and protect your colors from fading. Use in every load to help keep your clothes looking their best. Safe for all colors and for use in all washing machines. Make sure to go to Swagbucks on your computer or Mobile app to get your free SB before time runs out! If you don't know about #Swagbucks yet, it's the largest rewards website that gives people free gift cards for the things they do online. In addition to earning SB through the Search engine, playing Games, Watching videos, taking Surveys & more, they also like to give out Swag Codes for bonus SB! Redeem these limited-time-only Swag Codes whenever you see them and you'll get your gift cards even faster! This post is brought to you by Markerly for FitTea and Being Frugal and Making It Work. I received product samples to facilitate my review and a promotional item to thank me for my participation. As always, all opinions are 100% mine. It seems as though I have always struggled with my weight. As a teenager, even though I wasn't overweight, I still thought I was fat. Unfortunately, society has instilled a negative perception of how people (especially women) are suppose to look and how much they are suppose to weigh. Size 0 is not the "norm" people... in fact, I recently read that the average American woman wears a size 14 dress! As a mother of an 11 year old daughter, I have to constantly remind her that everyone is unique and different. I don't want her to struggle with feeling like the "fat girl" or that she's "too heavy" to participate in certain types of activities. TRUST ME, I work at her elementary school and hear those types of comments every single day... from girls as young as Kindergarten, and it breaks my heart! What is this world coming to when a 5 year old feels fat? 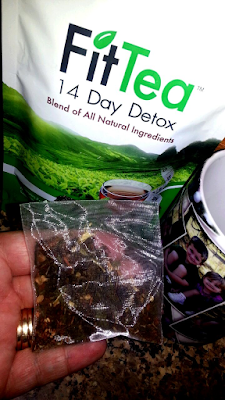 I recently took the FitTea 14 Day Detox challenge in addition to making the right eating choices, and was pleasantly surprised with the results. I will tell you about my results a little bit later. Right now I want to tell you that I loved the fact that FitTea is all-natural! In addition, it naturally gives you energy, boosts your metabolism, aids in digestive health and boosts fat-loss in those pesky problem areas. It's not a "secret" anymore! 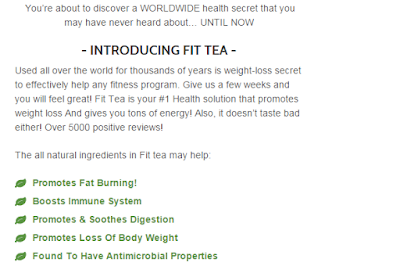 Now we can all benefit from this great tasting, all natural tea that helps promote weight loss, a happy digestive system, and healthy immune system. We also can't forget the other great health benefits as well, such as a boost in both your energy levels and metabolism. Don't Miss The Swagbusters Swag Code Extravaganza! TODAY ONLY! 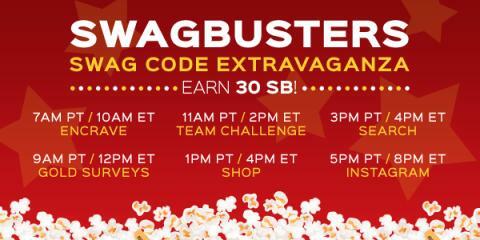 Swagbucks is giving out 30 SB in Swag Codes for the Swagbusters Swag Code Extravaganza! 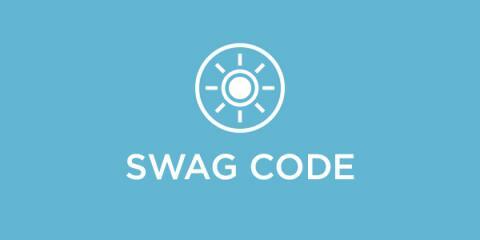 Check out the Swag Code schedule here for the where and when to make sure you get them all!! The Extravaganza goes until 6pm PDT/9pm EDT so make sure to grab all 6 Swag Codes! Not a member yet? Don't miss out on easy & fun ways to get gift cards for the many things you do online! Join today to take advantage of all the Extravaganza's bonus SB & get your first gift card even sooner! 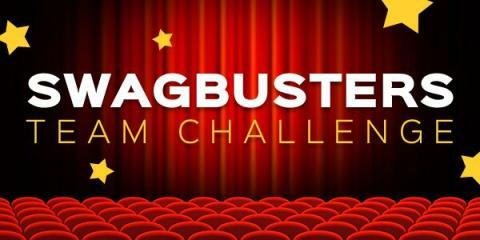 Swagbucks just announced a new Team Challenge: #Swagbusters! From now through June 19th at 12pm PDT / 3pm EDT, earn as many points as you can for your team & get bonus SB! How cool is that? Three For All ~ Earn 300 Swagbucks! JOIN for FREE, TODAY!! Swagbucks.com is one of the easiest ways to get gift cards just for doing the things you already do online! Searching, browsing, shipping, and so much more. I absolutely LOVE Swagbucks and the FREE REWARDS I earn each month. I save them up throughout the year, and then use them to pay for my kid's Christmas gifts! It's the perfect way to get them what's on their list and be a frugal shopper as well! But now, you can get even more SB when you invite a friend, to the tune of 300 SB! Refer someone to Swagbucks between now and Sunday, June 7th. When your referral earns 300 SB by the end of the month (June 30th), You AND your referral BOTH get 300 SB each! The 300 SB Bonus will be credited to all eligible members on July 10th.